Tires are not all created equally round. In fact, some are unevenly weighted. Tires are balanced with small weights to provide a smoother and safer ride. 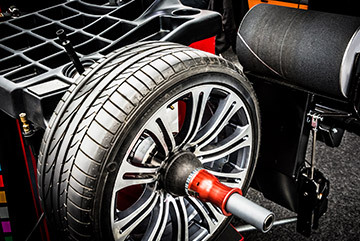 Tire balancing is often performed with rotations to ensure tires will wear evenly. When should my car be balanced? Our certified technicians can also detect if there is a more serious underlying issue. While we hope that is not the case, vibrations can also be a result of serious tire damage, worn suspension, or worn wheel bearings. Additionally, our shops offer specials that include free tire rotations and balancing on all newly purchased tires. Call Chabill's Tire & Auto Service now to schedule your next wheel balance in conjunction with your other auto repair services. Chabill’s Tire & Auto Service is proud to be the local auto repair shop and provider of tires nearest you!